Acoustic, delta blues,in Stormy Monday Gabriel is not a South American bluesman who got lost in Italy, but a hobo who found a Mississippi John Hurt unknown score in a bottle at a Nashville bar. A guitarist, singer, composer and band leader, Gabriel Delta was seduced by B. B. King's blues music when he was a young man in Buenos Aires. In 1988, he stood out in the competitive Argentinian music scene thanks to a painstaking alchemy of sounds merging elements deriving from the golden era of guitar blues (besides B. B. King, Albert and Freddie King were two more masters of the instrument for him) with the inventiveness of be-bop, funky expressionism and rhythm & blues. Yet, Gabriel has never betrayed his Latin roots, alternating the use of English and his mother tongue in his songs and incorporating into his repertoire the Memphis and Chicago music scenes with the pop and folk ones typical of his land. After successfully experimenting with this formula in Latin America, his approach would also pay off in a new phase of his career. After moving to Italy in 2003, he became a European protagonist and citizen with the group Gabriel Delta & The Hurricanes. In the course of his career spanning two continents and including North America, Gabriel Delta has shared stages, sessions and festivals with the leading exponents of contemporary blues music, including B. B. King, James Cotton, Eugene "Hideaway" Bridges, Taj Mahal, Roy Rogers, Kenny Neal, Larry Mc Cray, Melvin Taylor,the Blues Brothers Band and Watermelon Slim among many others. 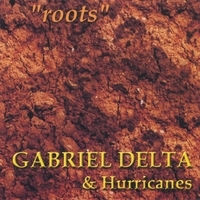 An expert and versatile musician, Gabriel Delta perfectly knows the dynamics of electric blues, but is at his best in softer and acoustic roots music episodes, as shown in the CD "Roots" (2005) and “Kusiwan” (2007), recorded in Vercelli and mastered in Buenos Aires. In the language of the Quechua population native of Argentina, “Kusiwan” is an invitation to live one's life happily and with determination in any circumstance; a philosophically bluesy approach which perfectly suits the musician's personality also when he chooses to express himself beyond the familiar twelve-bar structure. credentials to play as he does reside in his soul.